After one year successfully running of the BYSA girls football project it was our last session of 2016 on the 18th December 2016 at Saltley leisure centre. The project will return on the 8th January 2017. 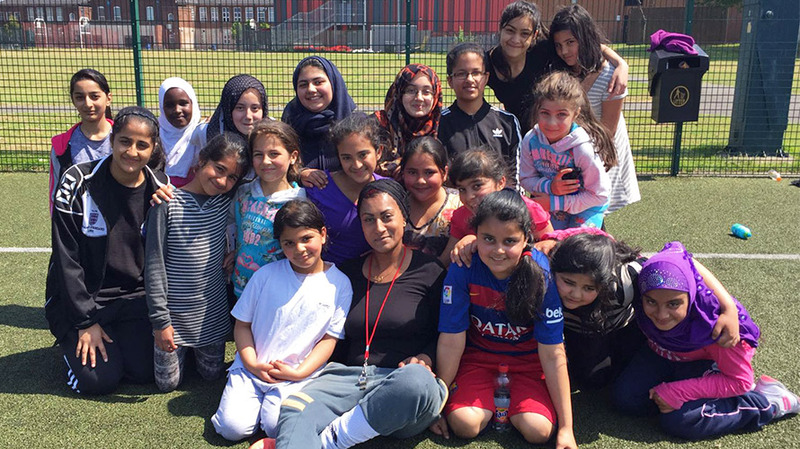 The project started with the help of the Saltley well-being centre offering the BYSA to expand its project and open it to the girls which has gone from strength to strength with the head coach Ms Amina Begum and assistant Ms Ummanaz Ali who have dedicated their time and efforts to the project and now train atleast 40/50 girls in our first year. The sessions are prepared to the ages of the girls that attend and well organised sessions to meet the needs of the girls that attend to take part and take something away from the sport. Head coach Amina states for the future plans of the girls project is to introduce working with clubs and having vocational and education trips as the BYSA have done for the boys in the past and she hopes to take the gilrs to watch a live football match which will be an enjoyable experience as non of the girl that attend the session have been to a football match so these are to change early next year 2017. Majid Salim Chairman of the BYSA and Amer Awan Vice-chairman of the BYSA attended the girls football to present them with a gift bag to celebrate one year of the project the gift bags were donated by our sponsors ranging from educational material, chocolates, hat/gloves and many more items that had been put together and presented to the girls on the day who were very appreciative for the gift bags. Comments from the chairman and vice chairman: “This is a wonderful day the kids have worked hard over the past year words can express the smiles and happiness we have seen from the kids and the volunteers so will continue to support this great project for many years to come and move it to a high level like the boys project”. We urge everyone to follow us on Facebook and view our webpage, the girls project will return on the 8th January 2017 so on behalf of the BYSA team we wish you a Merry Christmas and a Happy New Year.